Before I played Fire Emblem: Awakening I was pretty fond of the Fire Emblem series and had especially enjoyed Fire Emblem: Shadow Dragon. 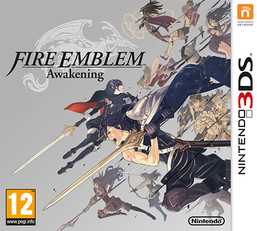 After playing Fire Emblem: Awakening I absolutely adore the series, will make every effort to play each and every one of them and now it might just be my second favourite of all Nintendo franchises. As with all games in the series, this is a strategy game with RPG elements. Unlike most strategy games which give you nameless generic units, the units in Fire Emblem games are specific characters with their own lives and stories, if any of them die, that’s them out of the story and you’re going to feel pretty guilty that your battle plan got somebody killed. To further humanise the units, and to add a further elements of strategy, placing two units together will strengthen their relationship with one another and give each of them stat boosts when they are around each other; by doing this you also unlock special conversations between the characters which give you a deeper insight into all of them. What’s nice is that the strengthening of relationships can lead to marriage and even children. I never expected that matchmaking would turn out to be one of my favourite features in this strategic fantasy game! However, I do wish this allowed you to develop non-heterosexual partnerships, but on the bright side, there is at least one character who appears to be bisexual. Also, knowing how much characters mean to each other means you’ll feel even worse if you let them die. Be careful when reading about the story of this game, because there are some big plot twists which are best left unspoiled. When reading fan discussions on the game, apparently its ‘impossible’ to go into Fire Emblem: Awakening now without having some of the big surprises spoiled, but I started playing about a year ago, and I managed to play through it all without ever coming across spoilers, so I have to disagree! All I’ll tell you is that you play as a tactician named Robin who is suffering with amnesia. Robin can be either male or female, and you get to customise him or her a fair amount. Robin comes across Prince Chrom and his group of soldiers known as The Shepherds and helps them fight against the undead Risen. From then on a long and clever story unfolds, one which is full of charming, memorable characters, difficult decisions, heartbreak and exciting plot twists. You can play the game in various levels of difficulty (one of which even removes permanent death, which might be appealing to some) and has a lot of content beside the main story of the game. For one thing, you won’t be able to get 100% without going through the story multiple times as there are various directions which the story can take, which also means that your first playthough is likely to be quite personal. There is also a StreetPass feature where you can battle against the teams of other players, or just buy items from them and you can also fight other players through a local multiplayer mode (sadly not online though). There is a lot of DLC for this game too; you can get several side quests for free, as well as the ability to download and battle or recruit a large number of heroes from past Fire Emblem titles, which is a nice feature for fans. Paid DLC gives you a large range of missions, some comical side-stories, some serious additions to the overall story, so there’s a nice range of additional content. On the whole, I was very, very pleased with Fire Emblem: Awakening. The gameplay is fun, the characters are well developed, the soundtrack is lovely and the story amazing. This is one of the best 3DS games and, even if you’ve never played Fire Emblem before, you should give this a try!